You may remember radon from the periodic tables you studied in science class, but what do you really know about it? Surgeon General warnings have named it the second leading cause of lung cancer, responsible for an estimated 21,000 deaths in the US each year. And while some scientists contest the accuracy of this number and question how hazardous it makes our homes, the CDC, EPA, American Lung Association and American Medical Association all agree that exposure to radon causes thousands of preventable deaths every year. Here are 5 things you should know about Radon in your home. 1. Radon is naturally occurring: It’s produced when uranium (an element found in nearly all soils) breaks down. This odorless, colorless, radioactive gas then moves upward into the house via cracks and gaps in the floors, walls and foundation. The radon is then trapped inside the home, where you spend much of your time. 2. It may affect your lungs: Not everyone exposed to high radon levels develops lung cancer, but inhaled radon gas continues to break down in the lungs, releasing energy that can damage lung tissue. Smokers exposed to high levels of radon are at an even higher risk to develop lung cancer. 3. 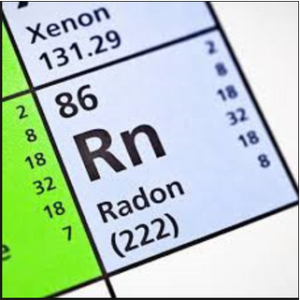 Radon is measured in picocuries: 1.3 pCi/L (picocuries per liter of air) is the estimated average indoor radon level. 0.4 pCi/L is the amount of radon normally found in outside air, and the US congress sets this number as the long-term goal for all homes. And while there is no designated safe level of radon, a level of 2pCi/L is achievable, and 4pCi/L or more requires action to reduce radon levels. 4. Testing is Easy (and fast): Short-term tests can take a few minutes to a few days to work, while long-term tests can require more than 90 days in your home. The EPA recommends using a short-term test first, and if results are high, test again and follow-up with a long-term test. Tests can be purchased at your local hardware store and conducted by you, or turned over to a professional mitigation company. 5. You can manage radon levels in your home: Sealing cracks and investing in proper ventilation systems can reduce radon buildup in your home. Newly-built homes can be constructed with radon-resistant features to limit the amount of radon that seeps inside. 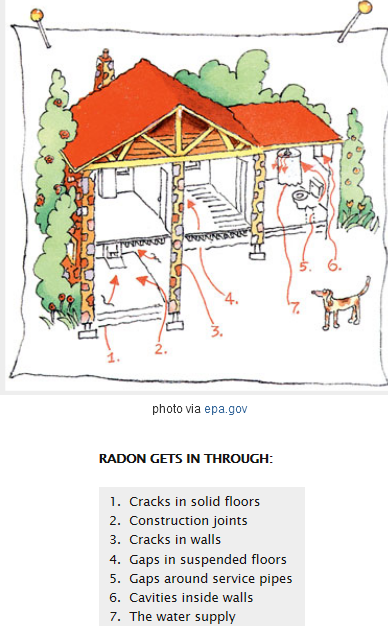 Below is a picture of possible entry points for radon gas. So while radon may be omni-present, limiting your exposure to it can help prevent any ill affects it may have on your health. If you are concerned about radon in your home or rental property, take the necessary steps to test for it and reduce levels if necessary.